New York; November 9, 2018: Women’s Health Editor-in-Chief Liz Plosser and Aurora Games Founder and Executive Producer Jerry Solomon today announced a broad-ranging partnership that makes Women’s Health a founding partner of the Aurora Games, the newly created sports and entertainment festival debuting August 20-25, 2019 at the Times Union Center in Albany, NY. Yesterday’s event, which centered around a panel discussion developed by Women’s Health, featured Ms. Plosser as the moderator alongside Aurora Games Advisory Board Members and Olympic icons Shannon Miller and Nancy Kerrigan, Grand Slam tennis champion and co-host of the SiriusXM radio show “Changing the Game” Rennae Stubbs, and National Women’s Hockey League star Taylor Manchin. Topics ranged from performing under pressure to preparing for competition to how sports experience contributes to success in the workplace. 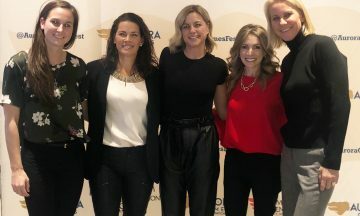 The Aurora Games is the first sports festival created with the specific goal of providing a platform to celebrate women in sports and entertainment. The inaugural event will feature competition between all-star teams composed of world class athletes representing the Americas and the World with six days of competition in tennis, gymnastics, basketball, ice hockey, figure skating and beach volleyball. Individual tickets to the Aurora Games will go on sale to the general public beginning Friday, March 8, 2019 to coincide with International Women’s Day. Daily tickets will range in price from $25 to $150 with full-series tickets available at a discount. Tickets will be available through Ticketmaster. Group sales and VIP Experiences can be reserved immediately by calling Alyssa Shane at (201) 926-8078. Aurora Games Festival, LLC owns and operates the Aurora Games and holds all of the rights and intellectual property associated with the Games. The Aurora Games were conceived of and created by Jerry Solomon. Mr. Solomon has been one of America’s top sports marketing executives for more than 30 years. The Aurora Games, named in honor of the Roman goddess of the dawn, will be held every two years beginning with the inaugural edition at the Times Union Center in Albany, NY, August 20-25, 2019. Designed to celebrate the best in women’s sports, entertainment and culture, the Aurora Games will welcome all-star athletes, as well as coaches and trainers, representing more than 15 countries to downtown Albany to compete in an international competition of teams comprised of the Americas vs. the World. The six-day event will include team and individual competitions in basketball, tennis, figure skating, gymnastics, ice hockey and beach volleyball. Fans will also enjoy musical performances, food tastings, sports clinics, autograph sessions and seminars in the Aurora Games Fan Zone at the Albany Capital Center. For up-to-date information about the Aurora Games, visit AuroraGamesFestival.com or follow the Games on Twitter @AuroraGamesFest. Women’s Health propels more than 39 million global consumers into action, providing the motivation and the inspiration for them to make instant, positive changes in their lives. Launched in October 2005 and published 10 times a year by Hearst Magazines, the magazine has received numerous industry accolades, most recently being named to Adweek’s annual “Hot List” and among Advertising Age’s “Magazines of the Year” in 2016 and 2017, as well as garnering an ASME National Magazine Award nomination in 2017 and 2018. With 19 international editions, the magazine continues to be the fastest growing women’s magazine in the world. Get more information at www.womenshealthmag.com and get instant updates via Twitter (@WomensHealthMag) and Facebook (Women’s Health Magazine) and Instagram(@WomensHealthMag). Check back as more events will be added….